Our Abpromise guarantee covers the use of ab190565 in the following tested applications. ab199093 - Rabbit monoclonal IgG (Alexa Fluor® 647), is suitable for use as an isotype control with this antibody. IHC image of ab190565 staining in formalin fixed paraffin embedded tissue section of normal human cerebellum. The section was pre-treated using heat mediated antigen retrieval with sodium citrate buffer (pH6) in a Dako Pascal pressure cooker using the standard factory-set regime. Non-specific protein-protein interactions were then blocked using in TBS containing 0.025% (v/v) Triton X-100, 0.3M (w/v) glycine and 3% (w/v) BSA for 1h at room temperature. The section was then incubated with ab190565 (1/50) in TBS containing 0.025% (v/v) Triton X-100 and 3% (w/v) BSA overnight at +4°C. The section was then counterstained and mounted with SlowFade® Gold Antifade Mountant with DAPI. The DAPI only control (no antibody) inset shows no autofluorescence, demonstrating that any Alexa Fluor® 647 signal is dervied directly from bound ab190565. 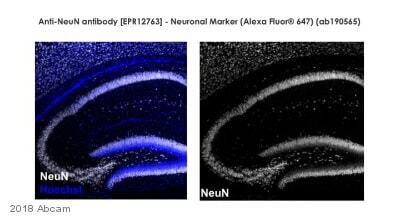 The separate images of ab190565 and DAPI alone, combined with the merged version of both signals, shows predominant co-localisation of the Alexa Fluor® 647 signal in the nuclei of the cerebellar granule layer. ab190565 staining NeuN in NGF-differentiated PC12 cells (7 days). The cells were fixed with 100% methanol (5min) and then blocked in 1% BSA/10% normal goat serum/0.3M glycine in 0.1% PBS-Tween for 1h. The cells were then incubated with ab190565 at 1/50 dilution (shown in red) and ab7291 (Mouse monoclonal [DM1A] to alpha Tubulin) at 1µg/ml overnight at +4°C, followed by a further incubation at room temperature for 1h with an Alexa Fluor® 488 Goat anti-Mouse secondary (ab150117) at 2 μg/ml (shown in green). Nuclear DNA was labelled in blue with DAPI. ab190565 staining NeuN in U87-MG cells. The cells were fixed with 100% methanol (5min) and then blocked in 1% BSA/10% normal goat serum/0.3M glycine in 0.1% PBS-Tween for 1h. The cells were then incubated with ab190565 at 1/50 dilution(shown in red) and ab7291 (Mouse monoclonal [DM1A] to alpha Tubulin) at 1µg/ml overnight at +4°C, followed by a further incubation at room temperature for 1h with an Alexa Fluor® 488 Goat anti-Mouse secondary (ab150117) at 2 μg/ml (shown in green). Nuclear DNA was labelled in blue with DAPI. 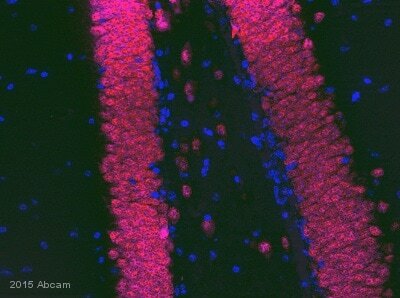 IHC image of ab190565 staining in formalin fixed paraffin embedded tissue section of normal rat cerebellum. 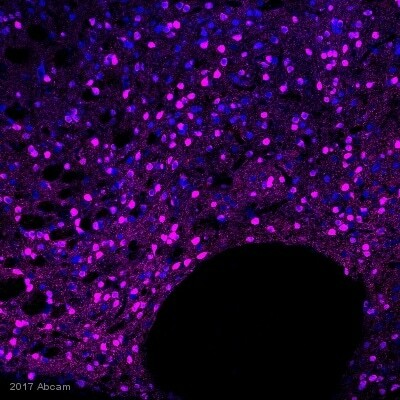 IHC image of ab190565 staining in formalin fixed paraffin embedded tissue section of normal mouse cerebellum. Publishing research using ab190565? Please let us know so that we can cite the reference in this datasheet. Cell harvesting/tissue preparation method: Tissue was chopped and treated with papain for 30 min. Single cell preparation was achieved by mechanically dissociating the tissue with a 5 ml stripet, fire polished glad pipette and p1000 tip. 1. 7-AAD labelled cells (debris on the left, labelled cells right, gated). 2. Shows physical parameters of the cells, 7-AAD positive cells are in green, they predominantly form a population low in forward and side scatter, and these cells were gated and displayed in grey. 3. Isolation of singlets forming a very low forward scatter from doublets gated and displayed in red. 4. Shows total event population with Alexa647 fluorescence on X-axis and 7-AAD fluorescence on Y-axis, cellular debris and autoflourescence can be seen but a distinct population of 647 positive singlets can also be observed and are gated in purple as NeuN positive cells. Ten thousand Neurons were collected for each sample. I was wondering if you think this antibody, ab190565, will work in flow cytometry as a similar product (same antibody, different conjugation), ab190195, is validated for Flow.